Explore the city your way! 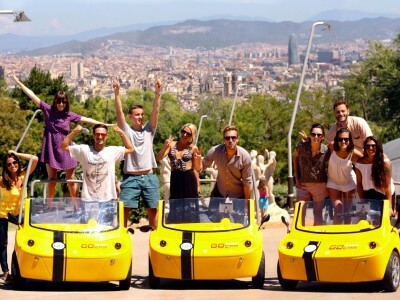 A GoCar city tour is an exciting, liberating way to explore the city your own way on your hen do in Barcelona! Basically, these little yellow cars give you and the girls the chance to become your own guides! Your group will be given one car for every two people, which you can use to cruise around the city at your own pace: see some famous sights and stop off for a refreshing snack or delicious tapas, then hop back in and see something else! If you are nifty at parking, these little cars can help you get in the best locations! The car has a GPS included with an intelligent audio guide that will explain the key information about the area you find yourselves in. This really is the best way for adventurous types to see the city at their own pace! A refundable deposit is required to take part in this activity! Costs for fuel and the safety briefing are included in the price. If you would like to add insurance for the GoCar let your party planner know and this can be added to the activity.